The UA Department of Art and Art History and The Summersell Center for the Study of the South invite you to an artist lecture with Sophie Lvoff. 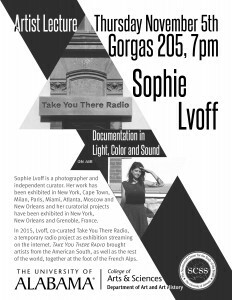 Lvoff will speak in Gorgas Library 205, Thursday, November 5 at 7:00 p.m.
Sophie Lvoff is a photographer and independent curator. Her work has been exhibited in New York, Cape Town, Villeurbanne, Fés, Lausanne, Arles, Milan, Paris, Miami, Atlanta, Moscow and New Orleans and her curatorial projects have been exhibited in New York, New Orleans and Grenoble, France. In 2015, Lvoff, along with five other curators, created Take You There Radio, a temporary radio project as exhibition streaming on the internet. Take You There Radio brought artists from the American South, as well as the rest of the world, together at the foot of the French Alps. Take You There Radio aims to transport participants and listeners to another place on an individual and shared level — a type of metaphysical travel that has occurred within audiences since the birth of radio as a popular media. Lvoff received a BFA from New York University in 2008 and an MFA from Tulane University in 2013. Her work has been published in Artforum, The Guardian, Daily Serving and the New York Times. In May 2013, Lvoff had a solo show at Good Children Gallery in New Orleans. In 2014, Lvoff was included in Prospect.3: Notes for Now, curated by Franklin Sirmans. She teaches photography at the Pratt Institute in Brooklyn. The Sophie Lvoff lecture is sponsored by The University of Alabama Department of Art and Art History and The Summersell Center for the Study of the South. Click here for more about Art and Art History’s visiting artists and lecturers. For more information, contact the UA Department of Art and Art History, (205) 348-5967. Information about visitor parking is available here: http://bamaparking.ua.edu/visitor-information/. Parking is free on campus in a legal space after business hours.